It’s a hotel designed by Oscar-winning duo Baz Luhrmann and wife Catherine Martin and it’s every bit as fantastical, glamourous and Hollywood- esque as you’d imagine it to be. Staying here is like taking a very fun sink down the rabbit hole, where contemporary art and the hotel’s 1940’s interiors blend into something unlike anything else available on Miami’s Mid-Beach. Juan Gatti art lines the walls of the entrance hall, a skeleton of a woolly mammoth encased in a gold-rimmed case by Damien Hirst stands watch over the pool, and the hotel’s custom-made soundtrack floats throughout the hotel. You get the picture. 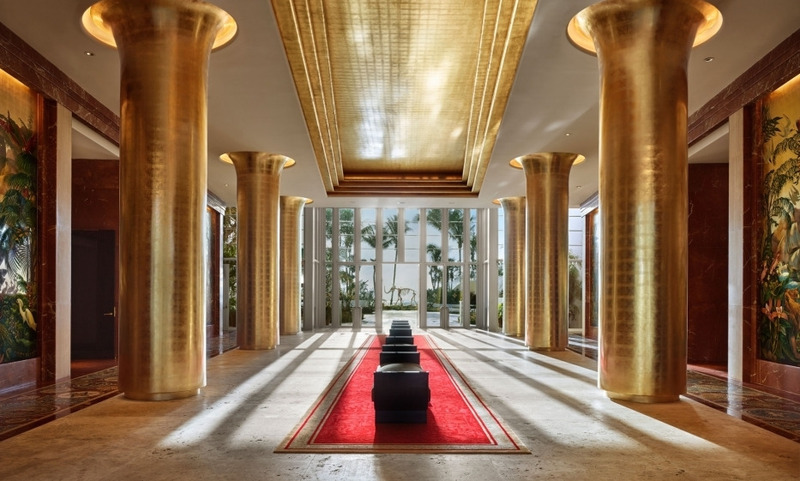 If you’re looking for something a little offbeat from which to enjoy Miami’s glamour, the Faena is it. Each floor features a signature Faena Butler offering exceptional services throughout the stay. The 36-seat private screening room and a selection of bars and lounges throughout the property. 100,000 sq. ft. of pristine beachfront with private beaches and Cabana Club. Thank you very much to the team and the consistently high caliber of service during a very hectic and busy weekend during Art Basel. Everything was perfect! I was very pleased with the Hotel and would definitely stay there again.Had friends in a nearby hotel and I liked the Faena better.